Unlike many online time and billing software that are available in the market, AccountSight offers an expense tracking software along with its online time tracking and invoicing software. The smart and simple expense tracker helps the users to record all relevant expenses occurred in a project as well as to track expenses from submission to approval. Similar to AccountSight’s time tracking software, the expense tracking process also demands for the administrator or the project manager to approve all the submitted expenses so that the client can be billed for the said expenses. In order to track expenses, the administrator first needs to define all the project expense types that will be considered billable within the scope of the project. 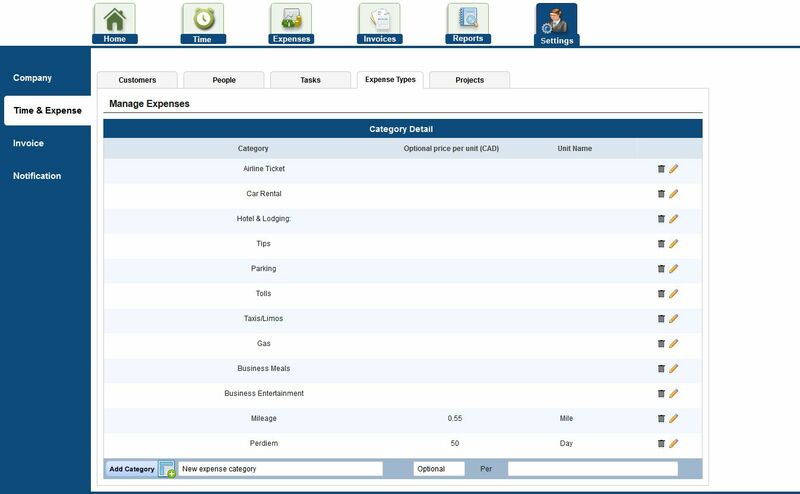 Administrator can add a new expense type or remove an existing one during any time of the project. Also, the price rate and the unit of measure of some standard expense items (i.e. mileage) can be adjusted as required. AccountSight’s user friendly interface makes it very easy to navigate from one tab to another and configure the expense settings. A number of mangers using AccountSight wanted to have flexible expense tracking and approval so that they could approve a single line or all the lines in an expense sheet. Alternately they could reject other expenses which are not acceptable at the organization. Invoicing personnel on the other hand, wanted capability to move past the stage of billing whatever has been approved. There is certainly a lot of value in having system feature that lets the mangers reject certain expenses that are outside the guidelines and don’t qualify billing rules. Most systems either allow managers to fully reject or fully approve the expenses. Most applications in the market DO NOT provide this feature. AccountSight expense tracker provides this flexibility where the mangers can select expense entry lines and approve them and reject only the remaining lines. The approved expenses can be invoiced without any delay by the invoicing personnel. This feature does help in expeditious collection of account receivables. Team members on the other hand, don’t need to redo the entire expense report before resubmitting for approval. This reduces the user time spent on the application. Does your business expense tracking software have these features? If no, why not give AccountSight a try then? AccountSight expense tracker along with its online time and billing software is available now for free trial. Register now to avail the 30 days free trial! AccountSight is a fast and easy online time tracking, expense tracking and invoicing software. It is a highly useful cloud based application for small businesses, consultants and freelancers for maintaining online timesheets and billing online as well as for mid-size companies that require online projects management, employee timesheet & expense tracking and online invoicing capabilities. The rich functionality and hassle free user experience makes AccountSight unique.